Cardio is a big part of getting in shape but so is weight training. You burn more calories when you have more muscle which makes pumping iron a crucial part of any long-term physical fitness routine. A good Smith machine can help you train every muscle group in the body. 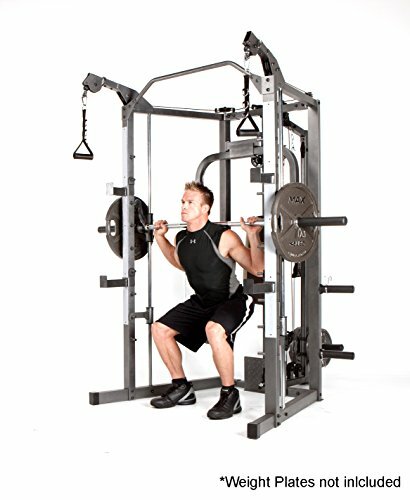 Personally, I wouldn’t buy the Marcy SM 4008 Smith Machine one or any other Smith machine. Even a bad one is not going to be cheap. But cost aside, they are big, take up a lot of space, and when they break it is your responsibility to fix it. If you want to lift weights—go to a gym. That way, when things break, they fix it and/or replace them. But if you don’t want to go to a gym and prefer working out at home, this is not a bad machine to go with. However, it isn’t a good one either. When I shop, I am all for value and durability. For its price on Amazon, Target, and Academy, this machine is a good value. However, the durability is questionable at best. I can overlook one or two reviews complaining about the parts, but there are quite a few when it comes to this machine. For that reason, I can’t recommend this machine. It may work great for the first 3-6 months, but pieces are going to break, and you’ll have an expensive hunk of junk to hang clothes on to dry. For the money you’re going to spend, you want something you can count on working. If you really want to spend some money on one of these machines, I’d recommend the StrengthTech EXM2500S Home Gym. But, to be fair, let’s examine the pros and cons of the Marcy SM 4008 Smith Machine a little closer. There is only one review on Target’s website and it gave the Marcy SM 4008 Smith Machine one star. 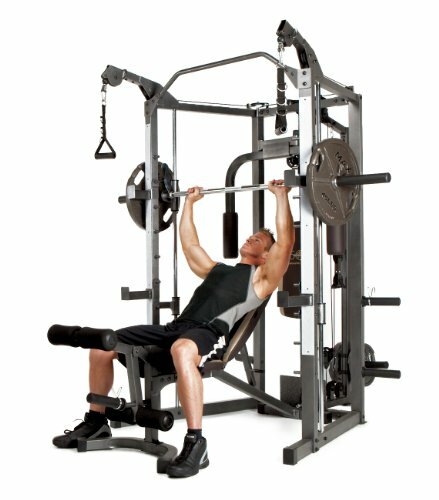 Walmart doesn’t offer the Marcy SM 4008 Smith Machine for sale on its site anymore, but 31 past customers reviewed it with an average rating of 4.0 stars. When you go to a gym, you can use several machines and stations to get a total body workout. But when you are setting up a home gym, you are not going to have as much space or capital to do the same. However, if you buy the right Smith machine, you will be able to get a good workout for every muscle group. Yes, you will have to stop to change out weights, move or adjust the bench, and/or prep a station. But the important thing is that you can cover every muscle group with just the one machine. It comes with all the straps and accessories you need for a better, more complete workout. Can you do anything and everything on it? Of course not. But for any exercise, it can’t accommodate there is an alternate exercise that it will. The problem with machine weights is that since the motion is controlled, you only get the benefit that comes from lifting the weight on just that plain. You don’t challenge your muscles as much as you could. But with free weights, your muscles are more engaged since they are controlling the front-to-back and side-side motion as well as the up and down. With free weights, you also work on balance, coordination, and range of motion along with strength. So, with them, you don’t just become stronger. You become a better all-around athlete. When you have a Smith machine like this at home, you want to make sure it is going to do a couple of things—well, not do a couple of things. You want it to be strong enough not give under the weight, and you want it stable enough not to tip over. 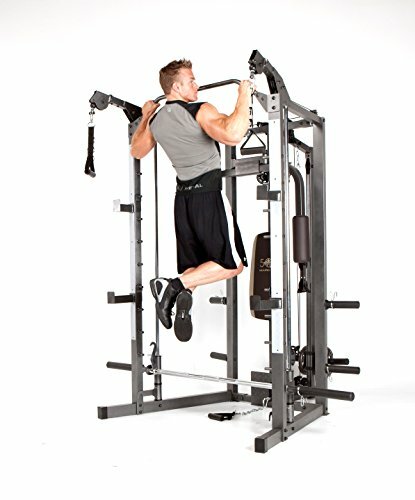 The Marcy SM 4008 Smith Machine has a steel frame that is not going to bend under the pressure of the weights. There are no holes in the frame that allow you to bolt it down. But it is wide enough to keep the weight distributed sufficiently so that it will not tip over on you. Working out at the gym can be great for many reasons. But there is one benefit at home on your Smith machine that no gym can ever match. At home, your workout will never be held up because of some meathead that is taking forever to do two heavy reps on the one station you need. Well—that is, unless you are working out with your brother, sister, or a friend and they happen to be that meathead. But when they are family (or a friend), you can tell them to get a move on and lift already! As for the meathead at the gym? Yeah—you might not want to say that to him. Wait—wasn’t free weights one of the pros? Yes, it was, but sometimes when you take the good, you have to take the bad along with it. In this case, it’s the fact that the weights are sold separately. Not only do you have to spend a few hundred dollars on the machine itself, but you have to spend a few hundred more on weights, so you can even use the machine. Not only that, but the bar that comes with the Marcy SM 4008 Smith Machine is not your standard Olympic bar; it’s about 20 pounds lighter. At some point, if you keep up with your workouts, you’ll need to buy a better bar. 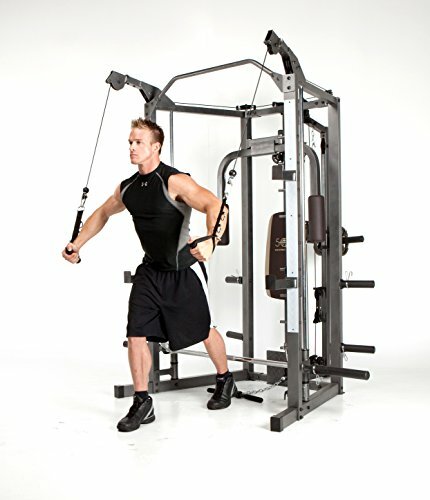 While you get to use free weights with it for benching and squatting, it is connected to the machine. That means when you do either exercise, you are getting some assistance from the machine. You are not engaging your muscles as well as you usually do with free weights. But there are safety catches built into the machine, so you can lift a little heavier and be safe even if you don’t have a spotter. 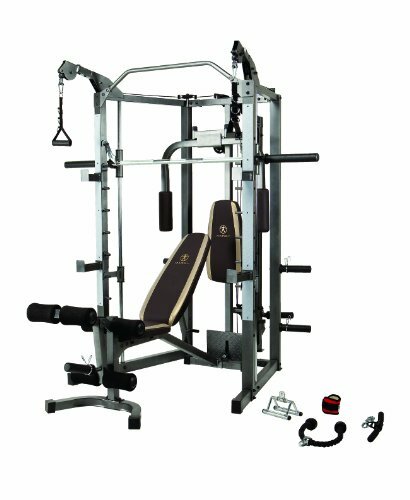 The steel frame is something that many reviewers complimented and something that has been used as a selling point for the Marcy SM 4008 Smith Machine. However, several users complained in their reviews of the different parts on the machine that are plastic and relatively easy to break. The frame was good as were the steel cables, but many people had issues with the pulleys breaking or continually needing to be adjusted. Several items that are necessary for the machine to be appropriately utilized are made out of plastic. Many reviewers had trouble with those pieces breaking. You can get away with the plastic pieces longer if you only use the machine every so often; like a couple times a week and with light to moderate intensity. But if you plan on working out hard on a daily basis, you can expect something to break within a few months. When you are buying a Marcy SM 4008 Smith Machine that will allow you to get a total body muscular workout, you have to expect it to take up some space—and it does. Before buying one, make sure you have a spare room or a large enough garage for it to go in. You will at least need one half a two-car garage for it. As for the construction, it’s not that the machine is poorly made (but there are some cheap parts). People talked about needing from four to 12 hours to put it together—and with help! Some called the process easy, but more complained about it and said it was very difficult. Many also complained about the instructions and diagrams. They felt that they were incomplete and confusing at times—especially when it came to the pulleys. Some of the pieces are heavy. So to get them in place and secure them safely, you need more than two hands. Either that, or it will take you even longer to do it (safely) by yourself. The bottom line is this—it is so much easier to get out of shape than it is to get back in shape. It’s more expensive too! Will the Marcy SM 4008 Smith Machine help you get in better shape? Yes, but you’ll feel as frustrated as an overweight kid in a sugar-free candy shop putting it together. If that were the end of the issues with this thing, that would be fine. But there are more. If you are going to spend the money on one of these, chances are you are planning on using it a lot. From what many of the reviewers said, it sounds like one or many of the plastic parts are going to break on you right around the time you start seeing some nice gains. To be fair, the number of reviewers that complained about parts breaking do not outnumber those who complimented the durability of the parts. But with my money on the line, I’d feel better if there were not as significant a number of people that did. If you really want to get your workouts in at home, spend the money on a better piece of equipment. 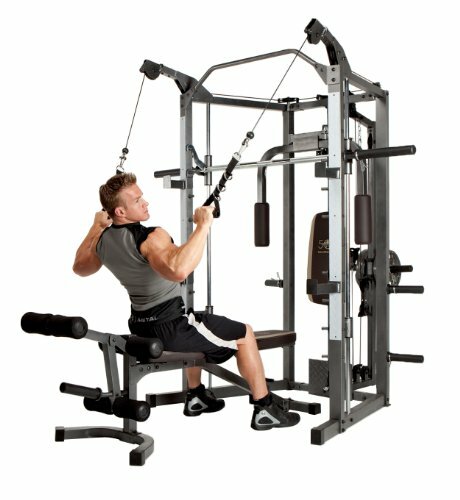 I’d recommend the StrengthTech EXM2500S Home Gym. I certainly wouldn’t recommend this one. It’s not a bad machine; I just can’t call it a good one.